Starting March 15th, once again, more than 100,000 Vrajavasis, devotees, farmers and people from various organizations will march from Vrindavan to Delhi to stop the abuse of the Yamuna River. 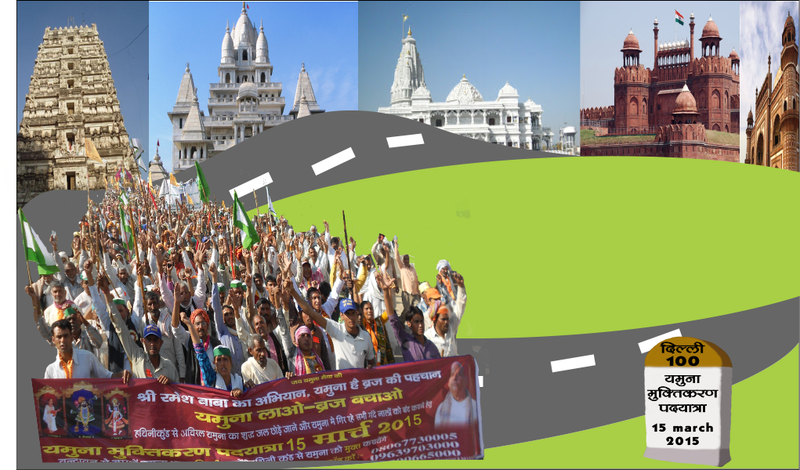 This Pada Yatra represents a turning point in the popular Save Yamuna Campaign and takes place under the name “Yamuna Muktikaran Abhiyan”. This kirtan aims to once more draw attention of the general public and authorities in India that it is necessary to take immediate steps. The urgent need is to allow fresh natural water to be released at Hathini Kund Barrage. This water should be allowed to flow the entire course of the Yamuna riverbed. This time the campaign will actually provide support to the government to promptly resolve the issue, provided the fact the present government is genuinely trying to revive Indian rivers. The 1,375 km long Yamuna River is still being robbed of all its waters only 200 km after its birth. All the waters of Yamnotri are taken away at Hathini Kund Barrage in Haryana not far away from its spring. What remains after that is dry riverbed into which Delhi pours its partially treated sewage. The Yamuna riverbed in Delhi is being used as a canal to transport Delhi’s sewage to Agra Canal. Thus, what flows on Yamuna riverbed in Delhi, Mathura-Vrindavan and Agra is simply and only sewage of Delhi (without one drop of original natural fresh water of the river). The same is supplied as drinking water to Vrindavan, Mathura, and Agra after a very basic (insufficient) treatment. Everyone is warmly invited to join in and support to this cause of the highest urgency – restoring the original flow of Yamunaji in Vraj. The organizers say: “this is extremely important both spiritually and scientifically. Your concern and actions can bring back this timeless river to its people, culture and ecology. It will bring blessings and happiness to you personally. It is a devotional service to Vraj Bhumi, Vrijavasis, and hence Lord Krishna. The Save Yamuna Campaign shall continue until the river gets its due. Every river deserves a basic ecological flow of natural waters throughout its course. 22nd Sarita Vihar to Ramlila Maidaan.